I’m excited to announce the ability to automatically install apps for end users, making it easier to distribute the right apps to the right set of people. Apps deliver data that your end users need to do their jobs. Now you can automatically install these apps in the Apps content list rather than the user having to find the app in Microsoft AppSource or follow an installation link. This capability makes it easier for you to roll out standard Power BI content to your users. Your tenant admin enables the ability to push apps. This is done in the admin portal (part of the Power BI service) on the Tenant settings tab. Switch the setting to Enabled and then specify who gets this capability (entire org or specific security groups). Remember that tenant setting changes can take some time to take effect, usually around 15 minutes. Once the admin has enabled it for them, app publishers will have a new option available to install the app automatically. 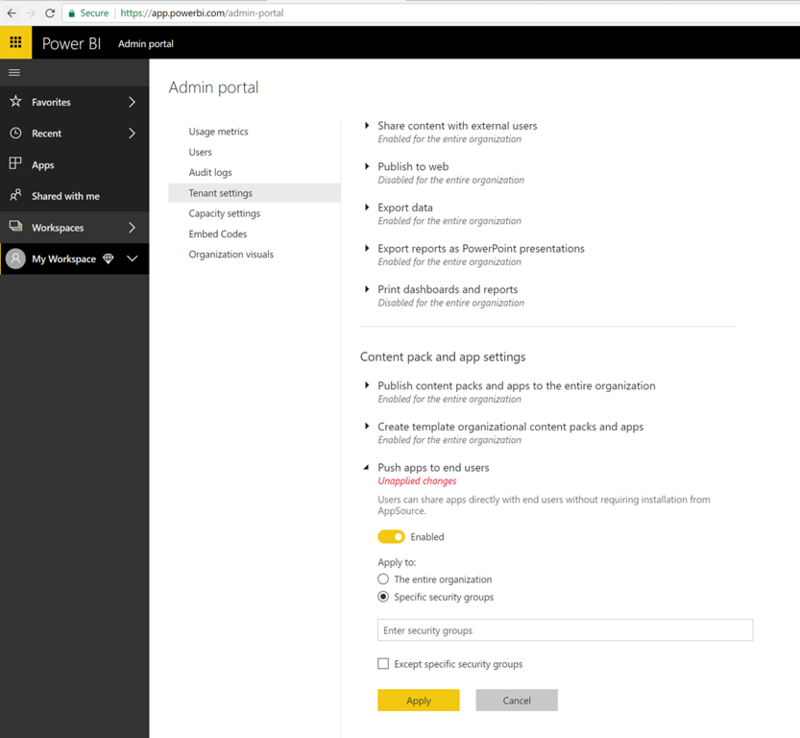 When the box is checked and the application publisher selects Finish (or Update app, for existing apps), the app will be pushed to all users or groups defined in the Permissions section of the app on the Access tab. After you push an app, it will show up in the Apps list automatically. You can curate the apps that a user or job role in your organization need to have at their fingertips. We hope this feature makes distributing content to Power BI users much simpler. Pushing an app to users can take time. While most apps will install immediately for your users, pushing apps can take time. It depends on the number of items in the app and the number of people given access. It’s recommended that you push apps during off hours with plenty of time before users need it. Verify with several users before sending broad communication about the app’s availability. Refresh your browser. Before seeing the pushed app in the Apps list, the user may need to refresh, or close and reopen their browser. If the user doesn’t immediately see the app in the Apps list. they should refresh or close and reopen their browser. Please wait 24 hours before reporting to an issue Microsoft. Don’t overwhelm users. Be careful not to push too may apps so your users perceive the pre-installed apps are useful to them. It’s best to control who can push apps to end users to coordinate timing. You can establish a point of contact for getting apps in your organization pushed to end users.